Windows Error Reporting (WER) is a flexible event-based feedback infrastructure designed to help advanced administrators or Tier 3 support gather information about the hardware and software problems that Windows can detect, report the information to Microsoft, and provide users with any available solutions. This reference provides descriptions and syntax for all WindowsErrorReporting cmdlets. The information on troubleshooting presented below will be helpful for troubleshooting advanced issues that have been escalated and that may require data to be sent to Microsoft for triaging. 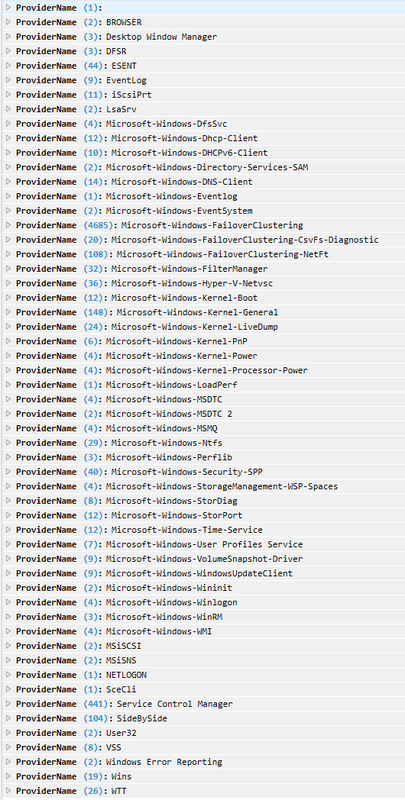 When Windows Server is installed, many event channels are enabled by default. But sometimes when diagnosing an issue, we want to be able to enable some of these event channels since it will help in triaging and diagnosing system issues. You have to remember to enable the same event channels on every new server node that you add to your cluster. When diagnosing, it can be tedious to enable specific event channels, reproduce the error, and repeat this process until you root cause. These event channels will be enabled on every cluster node when the cluster service starts or whenever the EnabledEventLogs property is changed. After you have enabled event channels, you can use the DumpLogQuery to gather logs. The public resource type property DumpLogQuery is a mutistring value. Each string is an XPATH query as described here. When troubleshooting, if you need to collect additional event channels, you can a modify the DumpLogQuery property by adding additional queries or modifying the list. get-WinEvent -FilterXML "<QueryList><Query><Select Path='Microsoft-Windows-GroupPolicy/Operational'>*[System[TimeCreated[timediff(@SystemTime) &gt;= 600000]]]</Select></Query></QueryList>"
(Get-ClusterResourceType -Name "Physical Disk".DumpLogQuery += "<QueryList><Query><Select Path='Microsoft-Windows-GroupPolicy/Operational'>*[System[TimeCreated[timediff(@SystemTime) &gt;= 600000]]]</Select></Query></QueryList>"
Inside the WER folder, the ReportsQueue folder contains reports that are waiting to be uploaded to Watson. Inside the WER folder, the ReportsArchive folder contains reports that have already been uploaded to Watson. Data in these reports is deleted, but the Report.wer file persists. Windows Error Reporting provides many settings to customize the problem reporting experience. For further information, please refer to the Windows Error Reporting documentation. Next, start triaging from the Report.wer file — this will tell you what failed. Since the resource failed to come online, no dumps were collected, but the Windows Error Reporting report did collect logs. 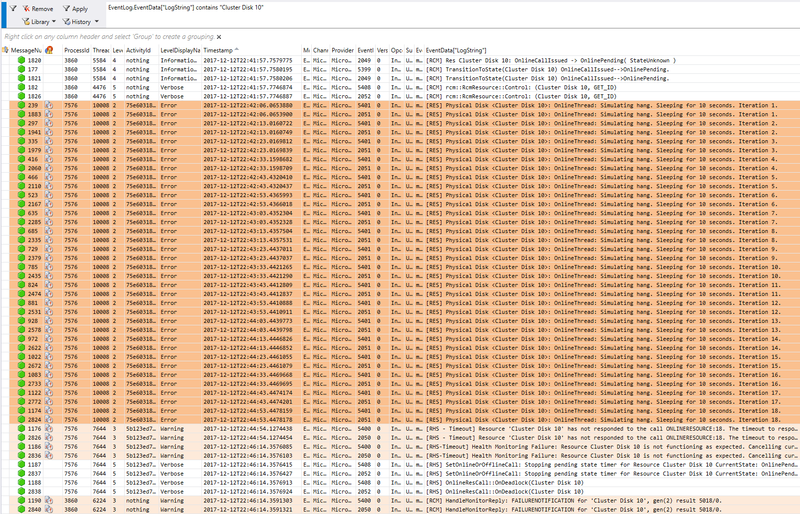 If you open all .evtx files using Microsoft Message Analyzer, you will see all of the information that was collected using the following queries through the system channel, application channel, failover cluster diagnostic channels, and a few other generic channels. Message Analyzer enables you to capture, display, and analyze protocol messaging traffic. 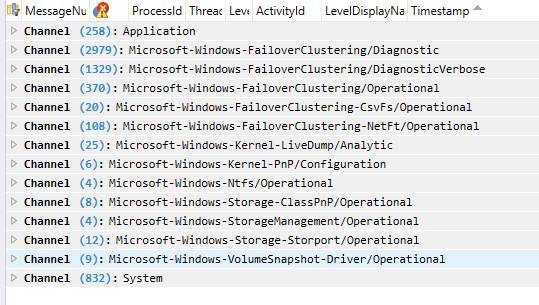 It also lets you trace and assess system events and other messages from Windows components. You can download Microsoft Message Analyzer from here. When you load the logs into Message Analyzer, you will see the following providers and messages from the log channels. Next, start triaging from the Report.wer file — this will tell you what call or resource is hanging.